Emigrant Creek Cabin has been remodeled and redecorated inside and out. 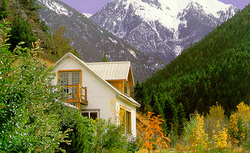 The property is centrally located in Paradise Valley surrounded by the majestic Absaroka mountains. The Forest nearby is an ideal setting for hiking, riding horseback, cross-country skiing and general appreciation of nature. Chico Hot Springs is just a mile away, where you can enjoy the hot springs pool and tubs, fine dining and entertainment. The city of Livingston with its many art galleries, gourmet restaurants, unique shops and community theaters is an easy drive as is the Yellowstone National Park to the south. The cabin has one bedroom cabin; one bathroom with tub and shower; kitchen with stove, refrigerator; a couch in living room that converts into a double bed; BBQ; phone with long distance block and satellite TV. No smoking or pets please. Directions: Emigrant Creek Cabin is located 28 miles south of Livingston, Montana. Turn off Highway 89 to Chico Hot Springs. Go past Chico Hot Springs to Old Chico take a left up Emigrant Creek proceed 1/8 mile.